I remember when the owner of the house passed away in 1980, and the Chamber bought it. My dad was active in the Chamber, having just purchased the Ben Franklin from Herb Ehm in 1978. For a while after that, the Chamber office was there in the house. 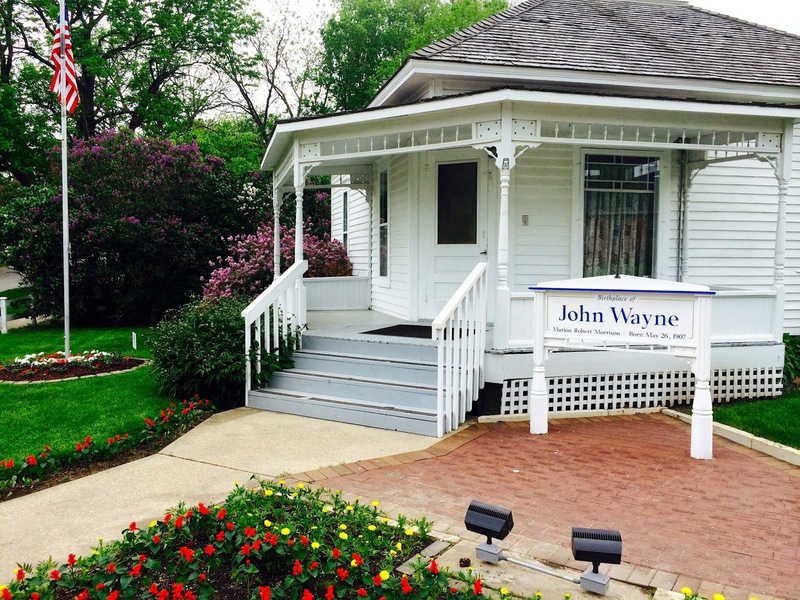 As people kept stopping by and wanting to see the place where John Wayne was born, he and others realized there was a great opportunity in front of them to provide a destination for the many people who not only loved John Wayne movies, but wanted to learn more about his life. Many Winterset citizens’ lives were touched as they set about transforming the little Victorian house into a museum, filled with artifacts that were donated by the Wayne family and others, and eventually adding a welcome center and gift shop that would come to entertain 40,000 visitors per year. Even for those in town who are not John Wayne fans per se, that’s a lot of people who have come to spend their money in our restaurants, our stores, our lodging facilities…. it has touched a LOT of lives, and continues to do so. Brian Downes had been a John Wayne and western movie enthusiast for many years, but had never contemplated coming to Winterset until 2006, when he happened to order something from the John Wayne Birthplace gift shop and received a note in his package from one of the ladies who was working there, letting him know that a big John Wayne centennial birthday celebration was being planned for May of 2007. He’d been working at the Chicago Tribune for the last 35 years and participating in a Wild West show on the side, feeding the hobby and interest he’d had since he was a young boy: learning about John Wayne’s life, friends, family, and co-stars. He was always seeking opportunities to learn more. During his time at the Tribune he had met and worked with John Wayne on a couple of projects, near the end of the Duke’s life, as well as many of his cohorts and bit-part actors, becoming well acquainted with many of them, including Maureen O’Hara. The note he received from the birthplace that day piqued his curiosity, and eventually he made contact to inquire about bringing the Wild West show to town as part of the celebration. He recalls the day he first pulled into town in the dead of winter in 2006 to start those discussions. “I looked around and wondered, ‘Is this for real? It looks like a movie set! '” He was, and still is, glad John Wayne was born in Winterset, when he could have been born anywhere. 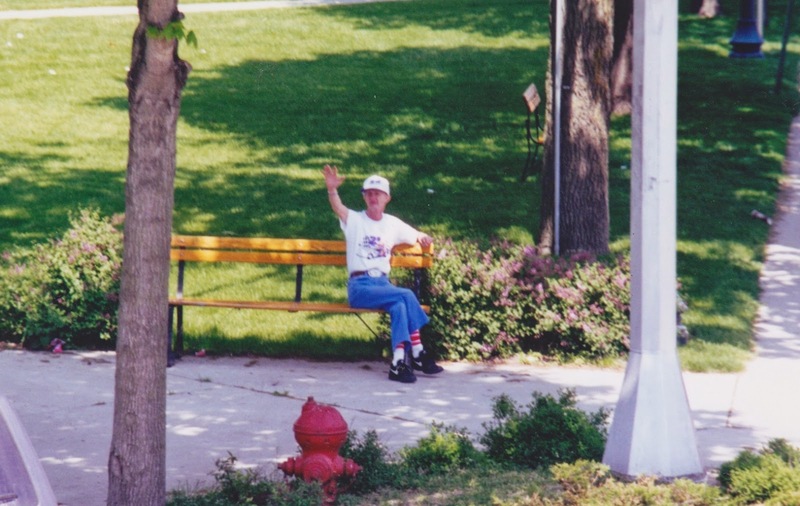 He sees it as the all-American town, and authentically so, not contrived. 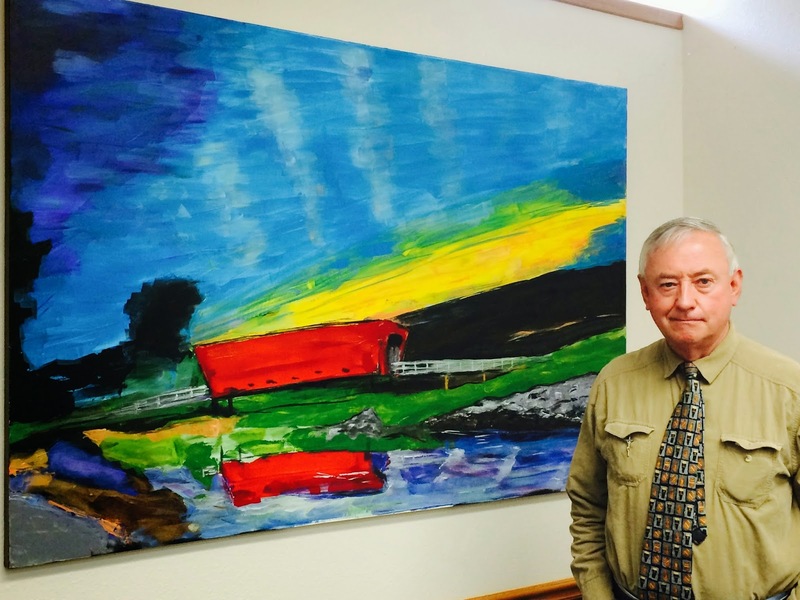 A year and a half after his first visit, the window of opportunity in Winterset opened completely for Brian Downes, and he moved from big city Chicago to small town Iowa to become the Executive Director of the John Wayne Birthplace. “It was the best thing I ever did in my life,” he reflected. “The timing was perfect.” The work was not easy, however, because the first order of business was to raise funds for a brand new, expanded museum to honor the major American icon that had completely changed his life. The birthplace museum was bursting at the seams in its current location, and they needed to expand to keep up with their collection and better serve John Wayne’s fans. 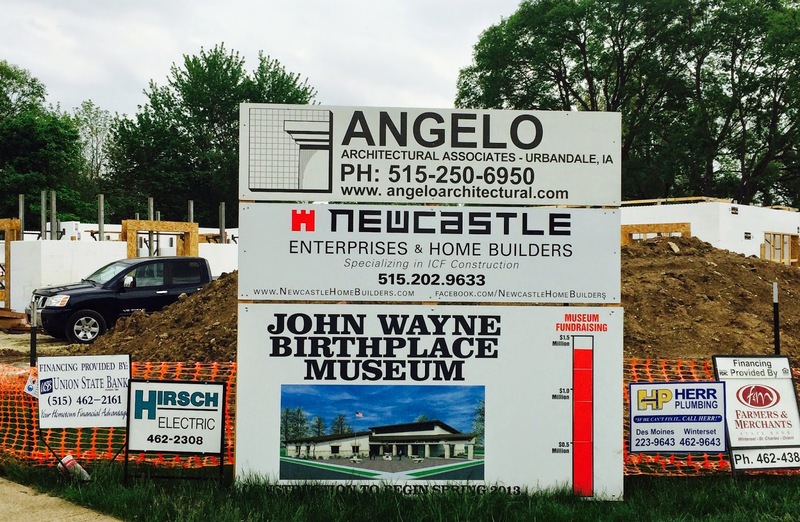 Six years later, the work is now well underway to complete the new 6,100 square foot museum on John Wayne Drive, and they are just $300,000 short of their $1.5 million goal. The birthday celebration that brought Downes to town in 2007 was so successful that it became an annual tradition, and he estimates that about half the crowd each year is made up of people who make a yearly pilgrimage to attend, meeting up with other John Wayne fans they’ve gotten to know here in years past. There’s a group of people who come from Kansas City, for example, who didn’t know each other previously but now coordinate travels and share a table every year at the Saturday evening banquet. And they’re not alone. People come back year after year because they love the whole package; John Wayne and Winterset. It’s that time of year once again when the John Wayne fans will be out in full force to celebrate his birthday, from Friday the 23rd through Sunday the 25th, and the events of this weekend will boost the local economy as well as putting a big dent in the remaining $300,000 needed for the completion of the museum. There are a ton of great things planned, and I’ll share the whole schedule here as usual on Thursday, as provided by Brian Downes and Wayne Davis. In the meantime, you can go to this link for a complete listing, and go here to make your reservations for the benefit dinner and auction on Saturday night. And even if you’re not involved in the festivities at all, prepare to greet the incoming with a friendly Winterset wave. Visitors to the 2015 John Wayne Birthday celebration will get to see the new museum, now under construction. With beauty like this, we just have to share.